Signs came as ordered. Look like they will hold up well. Quick and easy to find what I needed. Very easy and quick, loved the ease of customizing my label/signs, thanks! Love my signs, thanks again! Quality workmanship, good value and met all my expectations. Easy to navigate pleasantly pleased with service, price, and promptness of delivery. We needed the custom sign and this was easy to play with until we got what was right for us. Thanks. The signs arrived faster than expected and look perfect. Totally recommended. ChemAlert – Key chemical safety management information including Hazards and GHS Classifications, Risk and Safety Phrases, First Aid information and recommended Personal Protective Equipment. Chemical Compatibility Database - Contains more than 24,528 entries covering 584 chemicals and 42 materials. Chemical Safety Data Sheets – Displays International Chemical Safety Cards [ICSC] produced by the United Nations Environment Programme (UNEP), the International Labour Office (ILO), and the World Health Organization (WHO). Crane Operator Hand Signals - Gives users instant access to all necessary crane hand signals. Dakota EHS - Searchable, plain-language digest of federal Environmental Health and Safety regulations. Includes EPA, OSHA, and DOT. FallProof – Fall Distance Calculator helps accurately calculate the required fall clearance based upon the equipment being used and the height of the anchorage point. Megaman Lux Meter – Measures light levels of an environment and gives lighting tips. NIOSH Pocket Guide To Chemical Hazards – Gives information on all 677 chemicals in the database including all the resources of the NIOSH Pocket Guide and more. NIOSH Lifting Calculator - Evaluate both existing and proposed lifting conditions to determine the Recommended Weight Limit (RWL) of a specific job or task. OSHA Audit - Performs completely electronic safety audits. OSHA Heat Safety Tool – Get the heat index for your work site and precautions to prevent heat illness. Pocket First Aid – American Heart Association Guidelines on CPR & Emergency Cardiovascular Care. Sound Meter – Turns your device into a handheld sound level meter. USW Safety – An easy and accessible chemical safety reference for workers. And more new apps are being developed every day. Read more on safety apps and other ASSE Safety 2013 news at ISHN.com. Hazard Communication 2012: One Year of Implementation will focus on issues associated with classification, labeling, safety data sheets and training. Also on the agenda are ways for manufacturers, importers, distributors and employers to meet compliance requirements during the transition period. The webinar is intended to answer many of the questions OSHA has received in this first year of Hazard Communication 2012 implementation. This webinar is free but registration is required. Get registration information here. What constitutes a hazardous area? How about janitor closets, electrical closets and fan rooms? The protection of hazardous areas varies throughout the different occupancies covered by NFPA 101, Life Safety Code. So, you can't just go with your gut - you have to look it up. What about those closets? Check this NFPA blog post to find out. OSHA has issued a final rule that broadens the current exemption for digger derricks used in the electric-utility industry. The exemption has been expanded to include telecom-munications work in addition to electric-utility work. This final rule provides a complete exemption from having to follow the requirements of Subpart CC of the Cranes and Derricks in Construction standard. The rule becomes effective June 28, 2013. Read more here. Caring for your PPE is just as important as choosing the right equipment in the first place. Keeping your PPE in good shape improves its life and saves you money. It will also ensure you are getting all the protection your equipment was designed for. Check this post from the SafetySmart blog for helpful tips on maintaining PPE in your workplace. Do you have any "accident-prone" workers? You might really have supervisors who are emphasizing the wrong things. A recent blog post from ISHN looks into frequently injured workers and outlines a safety coaching approach that can help you discover and address both issues. Read more here. Each June, the National Safety Council encourages organizations to get involved and participate in National Safety Month. 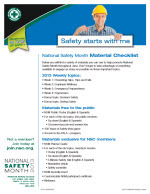 This year’s National Safety Month theme is “Safety Starts with Me.” The NSC has developed a variety of materials you can use to help promote National Safety Month throughout June. Visit the NSM page for more information. Watch the NSC Safety Month video on YouTube. Browse thousands of safety signs and labels at ComplianceSigns.com. The National Safety Council reports that slip and fall accidents cost U.S. companies as much as $70 billion every year in medical expenses and workers’ compensation claims. A typical compensation claim resulting from a slip and fall accident amounts to $4,000, and the Bureau of Labor Statistics cites them as the cause of 18 percent of lost-time incidents. But slip and fall hazards often don't receive the attention they should in workplaces. OSHA recently cited a company that had let a foot of wood shavings accumulate in a work area, posing a trip hazard. As with most preventable accidents, education is the place to start. The safety experts at Safety Management Group have prepared an article that takes an in-depth look at slip and fall accidents, hazards and prevention. Read the article here, or browse Wet, Slip and Trip Hazard safety signs here. ATVs were first introduced in the U.S. for agricultural use in the early 1980s. Since then, ATVs have become valuable assets in many workplaces. ATVs are commonly used by workers in construction, emergency medical response, search and rescue, land management and surveying, pipeline maintenance, farming and forestry. With more than 10 million in use, it is important to know the hazards associated with ATVs and how to operate them safely. 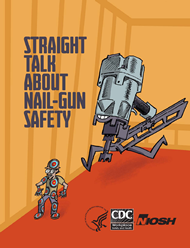 Straight Talk about Nail Gun Safety is a comic-book-style publication that explains how different types of nail gun triggers operate and discusses typical hazards faced by workers who work with or around a nail gun. Available in English or Spanish, the information in the publication is based on NIOSH supported research; Nail Gun Safety: A Guide for Construction Contractors and focus group discussions with residential building subcontractors, safety specialists and workers. New nail gun users must receive safety training, not just a copy of this publication. Safety training requirements are described in detail in Nail Gun Safety: A Guide for Construction Contractors and can be viewed and printed or downloaded from www.cdc.gov/niosh/docs/2011-202/.